LAPORTE – Brant Mast and Jared Hoffman just do not want their final high school tennis season to end. 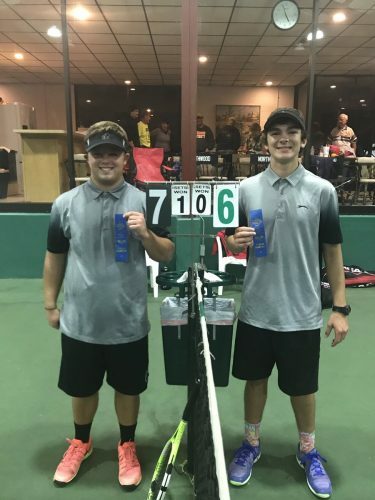 The NorthWood pair earned the right to practice for another week as they claimed a regional doubles championship Saturday. Mast and Hoffman, the No. 1 doubles team for coach Tif Schwartz’s squad, won a pair of matches to punch their ticket to the State Finals. Mast and Hoffman, both seniors, topped the Chesterton team of senior Blake Ellenwood and junior Chad Whelan 6-3, 7-6 (7-2) in the title match of the LaPorte Regional, which was moved indoors to the Lakeland Athletic Club in Niles due to the wet weather. Mast and Hoffman trailed 4-1 in the second set of the championship match before rallying to force the tiebreaker and then take the tough win. Mast and Hoffman, who are now 7-0 in the state tournament series, beat the Kankakee Valley team of seniors Samuel Sanders and Toby Aldrich in the semifinals Saturday 6-1, 6-0. The NorthWood duo, which won the Northern Lakes Conference Tournament championship, are now 21-2 overall this fall. They helped lead the Panthers to a 11-5 regular-season record, including a 6-1 mark and a second-place finish in the NLC. NorthWood, which had to play all of its matches on the road this season due to construction at the high school, was also second in the NLC Tournament. “Our postseason has really been a great challenge for these two, much like the season has been all year,” said NorthWood coach Tif Schwartz. “We have had some really fierce competition to face all along this journey. Mast knows a thing or two about postseason success. He and partner Cam Stillson won the individual sectional title a year ago before losing in the regional finals to Penn. “Am I surprised that Brant and Jared are going to State?, not really,” said Schwartz. “Brant was in this position last year before losing in the regional finals and Jared was there through the whole journey and hit with Brant and Cam Stillson as much as he could. They knew this season, as seniors, that they wanted to go farther and the hard work and dedication has even very rewarding. I am very proud of their efforts. Even when they are down in a match or things aren’t going well for them, they seem to dig a little deeper and make it better. Mast and Hoffman advance to play in the State Finals Friday at Park Tudor High School in Indianapolis. Quarterfinal matches are slated for 2 p.m. Friday. Semifinals will be contested on Saturday at 10 a.m. with the championship match at 2 p.m.